The following graph shows that Hogan is correct — the stock market and earnings have indeed grown at a similar rate since March 2009. 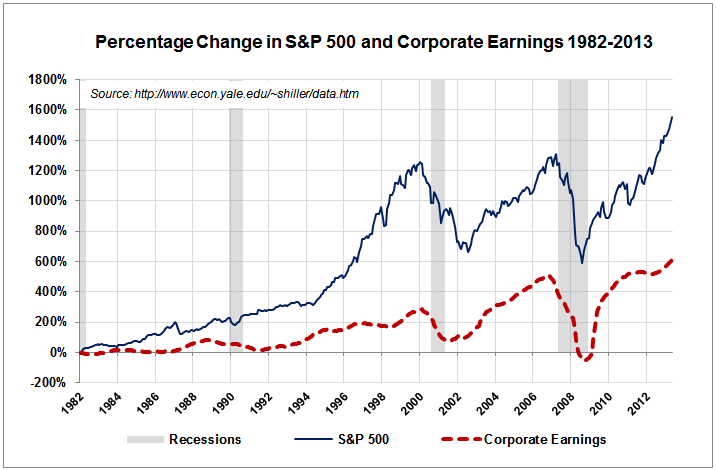 However . . .
. . . the problem is that stock values since 1982 have increased 1600%, while earnings have grown about 600%. Hogan focuses on one slice of the data — starting from an artificially-depressed bottom in earnings in March 2009 — and matches up the growth rates in the two series over the last cyclical bull cycle. Over the entire secular bull/bear cycle, however (1982-2013), stock values have appreciated at almost three times the rate of earnings growth. Hogan tries to cram a secular, multi-decade bull/bear story into one cyclical bull market cycle, with the net effect of conflating the bull/bear/overvaluation debate. Just as he is paid to do. Bottom line is the market will not correct until the final two indicators flash — when Ed Yardeni and Abby Joseph Cohen are trotted out to revive the “coordinated global boom” meme they pushed all the way up to the 2008 financial crisis — then you’ll know it’s time to run for the exits. I’m not sure exactly why but tbis site is loading incredibly slow for me. There’s no doubt that that you need to write more about this subject matter, it may not be a taboo subject but generally folks don’t discuss these topics. Fine Gardening Magazine is one of my favorite gardening magazines. you might want to look at backless benches since they allow you to face in either direction. U.S. Stocks May Not Be Overdue For A Correction After All Is the U.S. Economy Growing or Not?